These professionally made ribbons are worn on and around May 12th M.E. Awareness Day. They are also a popular choice for wedding favours; please Contact Me to discuss your requirements. The folded royal blue satin ribbons have a safety pin attached and metallic silver print (water-resistant). They read 'May 12th M.E. Awareness' on the left tail and 'www.mesupport.co.uk' on the right tail. They do not have a year date, therefore you can use them each Awareness Day. They are ideal to share with family and friends and always draw a lot of attention. M.E. 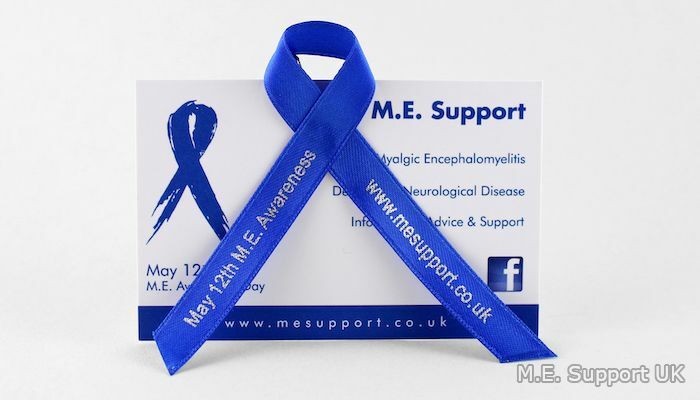 Support Ambassador Rochelle Hanslow writes, "These ribbons don’t need to be around for just May 12th, as you can wear them all year round to promote M.E. Support and the illness. They are great for other occasions, such as wedding favours. My husband and I decided to have 3 different charity/organisation favours alongside our CD favour for our wedding. Louise was really very helpful and made sure we got exactly what we needed and in great time too. The ribbon came attached to a card with the details of M.E. Support and looked really professional, yet personal too. Once added to our own organza bags, with our personal reasoning behind the choice, it really topped it off nicely and was a great quality item that helped M.E. Support and raised awareness." Priced at just 90p per ribbon, they are sold in packs of 5 totalling £4.50. If you would like to place an order from outside of the UK, please Contact Me for an international delivery quote.